The new American-built 2013 Nissan Leaf sports higher energy efficiency, including a highly efficient high end audio system from Bose. 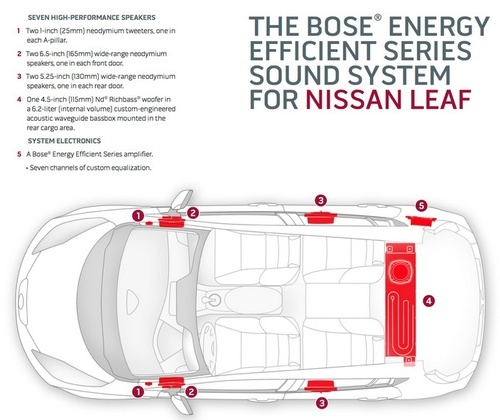 The quiet-on-the-outside Nissan Leaf now can come with an awesome, and energy efficient, Bose sound system. The Bose sound system is an option in the 2013 built-in-America Nissan Leaf, and features high quality powerful audio, without detracting from driving range, and instead is part of the overall story of higher efficiency of the 2013 Leaf. "Early adopters of electric vehicles were thrilled to have a zero-emissions vehicle and now that we're expanding the market and it matures, many customers are asking for more amenities in their EV," said Brendan Jones, Nissan director of EV marketing. "We wanted to be able to give them a premium sound system and be conscientious about the amount of energy required to do so." While Nissan's primary goal for the 2013 Leaf was to move production for North American sales to the U.S.A., another goal was increasing energy efficiency. That goal means wringing the most impact out of every watt-hour of energy stored in the battery pack. It would have been counter-productive to install a high end sound system in the 2013 Leaf that cut driving range by 10 miles, for example. Bose developed a sound system built around smaller speakers and amplifiers that achieve the same effect, but with much less power required. This includes a powerful bass unit compact enough to sit in the rear cargo area. It's made from a 4.5-inch Nd Richbass woofer in a 6.2-liter custom-engineered Acoustic Waveguide bassbox. The Bose Energy Efficient Series sound system has six lightweight speakers strategically placed and acoustically tuned to the Leaf interior for mid-high frequency audio performance. The two one-inch neodymium tweeters are located in the A pillars, while two 6.5-inch wide-range neodymium speakers are in the front doors, and two 5.25-inch wide-range neodymium speakers are in the rear doors. To top it off, the Bose energy-efficient amplifier operates on much less power and runs cooler than competitive sound systems. In the 2011-12 Leaf's, the rear cargo area used to contain the on-board charger. The charger, in addition to being upgraded to support a 6.6 kilowatt charge rate, has now moved into the front compartment in the 2013 Leaf. That left space for the Bose sound system to inhabit. Why is this quest for efficiency important? It's about making the most use of the energy on-board. This general goal is also true for fossil fuel powered vehicles, whether gasoline or diesel, and is the meaning of achieving higher miles-per-gallon ratings such as the new CAFE standards. That is, driving more miles using the energy stored on-board. In electric cars this efficiency is reported by the EPA as "kilowatt-hours per 100 miles". The Nissan Leaf battery pack contains 24 kilowatt-hours of electricity, and according to the EPA the 2012 Leaf requires 34 kilowatt-hours per 100 miles of range. A kilowatt-hour is the electricity quantity consumed when one runs a 1000 watt system (e.g. 10x 100 watt light bulbs) continuously for an hour. Hence, by improving the Leaf's efficiency means the 2013 Leaf should consume fewer kilowatt-hours per 100 miles of range, and therefore have a longer total driving range, on the same size battery pack. "The Bose Energy Efficient Series sound system delivers on all its promise for LEAF owners. It's remarkably efficient—without conceding on great musical performance," said Brandon Westley, president of the Bose Automotive Systems Division. "This system also demonstrates the unmatched advancements we've achieved in producing highly efficient audio technology in vehicles." What a Perfect Time to Buy a Used Electric Car! A Glut of EVs on the Used Car Market Makes Them a Steal!